In statistics and probability theory, the Gaussian distribution is a continuous distribution that gives a good description of data that cluster around a mean. 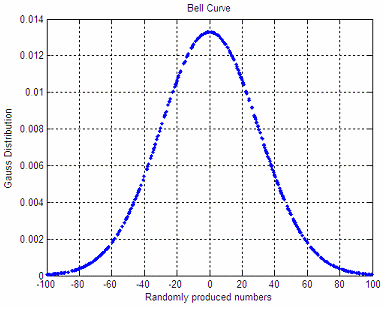 The graph or plot of the associated probability density has a peak at the mean, and is known as the Gaussian function or bell curve. Now, let’s use it in an example. 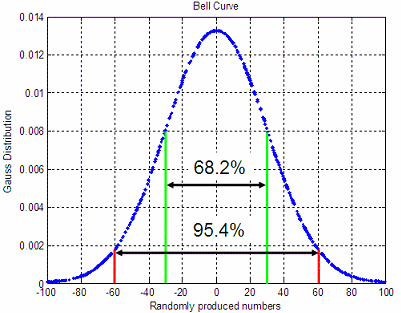 An important property of this bell-shaped curve is that the values less than one standard deviation from the mean (between green lines below) represent approximately 68.2% of the area under the curve, while two standard deviations from the mean (between red lines below) take about 95.4%, and three standard deviations account for about 99.7% of the area.